The Avalon Self Cleaning Bottleless Hot/Cold Water Cooler is made with innovation and style. The easy-to-use paddle spouts make it so much more convenient to use. Simply press your cup against the paddle to let the flow of water to come out. The machines highly efficient compressor makes the cold water crisp and ice cold at approximately 47° F without the need of adding ice cubes to your drink. The hot faucet is hot enough to cook one's tea or coffee or any other steaming hot beverage at approximately 185° F. Due to the extremely hot water, we’ve added a child safety lock on the hot water faucet. 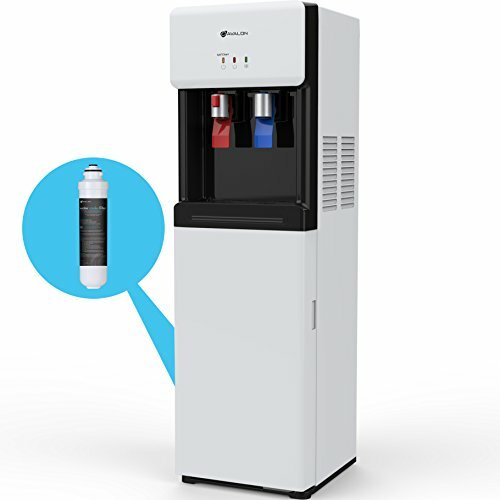 This water cooler is bottle-less with an NSF certified activated carbon filter and a sediment filter in the cabinet and a water line that can be attached to your water source. The water is taken from your water source and filtered through the filter and then through the machines hot and cold water tanks. The tanks hold 1 liter of hot water and 3.6 liters of cold water. The filter will purify the tap water eliminating any chlorine, lead, rust, and bacteria. There is also a built-in leak detector to automatically monitor the water flow from the water source into the machine. We have incorporated a self-clean ozone function which will automatically clean the machine’s water tank with the injection of ozone by the press of a switch. The water cooler is UL listed and complies with all standards of Energy Star. Setup is easy and the unit can be connected directly to your existing sink water line. All parts necessary for installation are included. The adapter to connect our water cooler tubing to an existing line is 3/8" which will fit most standard water supply lines. The filter and adapter are packaged inside the styrofoam on top of the water cooler inside the box. The dispensing area is 10x2.5x9.5 inches with 7.5 inches of space below the spouts. This will accommodate most large cups or bottles. There is a removable drip tray at the bottom of the dispensing area to catch any drips or spills. The unit dimensions are 13"x12"x41". If you have any questions about this product by Avalon, contact us by completing and submitting the form below. If you are looking for a specif part number, please include it with your message.